Syrian refugee Sarah, 14, displays a painting she made for Pope Francis. Credit: Daniel Ibanez/CNA. 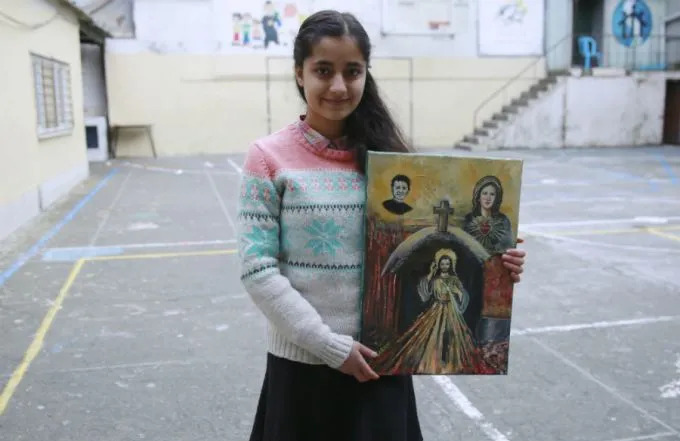 Istanbul, Turkey, Nov 28, 2014 / 11:39 am (CNA/EWTN News).- Currently a living as a refugee at a Salesian school in Istanbul, 14-year-old Sarah will give Pope Francis a picture that she painted, and says that she will ask him to pray for world peace. “My name is Sarah, and I made this picture in the name of the school to give it to the Pope. This is my picture with Jesus and Don Bosco, and here we have the glow of Don Bosco and the Sun of Jesus,” Sarah told CNA Nov. 27. Originally from Aleppo, Sarah has been living with her family as a refugee in Istanbul for a year, and is currently enrolled as a student in the Don Bosco center of Istanbul, which is run by religious and attends to the needs of refugees and immigrants. One of the handful of students who will meet with the Pope for a private encounter just before his Nov. 30 return to Rome, Sarah said that her mother is an artist, and helped her to do the painting, which will be given to the Pope in the name of the school. The Syrian conflict began in March, 2011 when anti-government demonstrations sprang up nationwide against Bashar al-Assad's rule. In April of that year, the Syrian army began to deploy to put down the uprisings, firing on protesters. Since then, the violence has morphed into a civil war which has claimed the lives of more than 200,000 people. The civil war is being fought among the Syrian regime and a number of rebel groups, which include moderates, such as the Free Syrian Army; Islamists such as al-Nusra Front and the Islamic State; and Kurdish separatists. The war has resulted in the flight of more than 3.2 million Syrians as refugees in nearby countries, most of them in Lebanon, Turkey and Jordan. An additional 8 million Syrian people are believed to have been internally displaced by the war. Pope Francis is set to meet with the children from the Don Bosco Center on the final day of his trip, after holding a private Mass, praying Divine Liturgy at the patriarchal church of St. George, and signing a joint declaration with Bartholomew I in the morning.